The level of service and attention you receive is matched with only the best in wedding entertainment, lighting and production services to assist you in celebrating one of the biggest days of your life. We customize our approach and style to fit your vision of the perfect wedding day. We start right away with laying out the groundwork, planning and collaborating using our online planning system, online resource center, in-person consultations, and our years of professional experience to turn your vision into a reality. Your wedding reception is the time to celebrate your big day, kick back, let loose and enjoy all of the time that you’ve put into getting ready for the day. We ensure the spotlight remains on you and your guests as we create the right mix, vibe and ambiance for your Wedding. We make sure you are always in the right place, at the right time so you don’t have to worry. You should be focusing on celebrating your big day with family and friends. We will work with your vendors and wedding professionals as a team to ensure the details are followed through smoothly. Don’t worry though, we won’t be making cheesy jokes on the microphone, singing silly songs, and surely won’t be dressing up in a chicken suit. We are professional, clear sounding and provide just the right amount of guest interaction that is not too overbearing or disruptive. We play a mix of suitable songs for everyone from the little ones to your grandparents. You will have as much or as little control over the music, styles and genres. During the planning time, you will have full access to our on-line music database well in advance and we can also assist you in deciding an appropriate selection of music for your formalities. We take your ”must play list” and “do not play list” very seriously and implement both in our set. The Reception is the main event where we help both plan and execute the details to fit what you have envisioned for weeks, months and maybe even years! Here’s just a list of few details we offer to all our clients. Planning & Coordination of the Reception. This includes face to face consultations, phone calls and E-Mail. This is where we discuss the event highlights, timeline, music selection and create your vision of the perfect Wedding day. It’s personalized, customized and uses my online planning system to create what you have envisioned for your big day. Making sure you and your Bridal party are always informed of what’s happening throughout the reception. Make announcements so you and your guests know what’s going on and what’s upcoming. Engage the crowd with a friendly and professional presence. Work and Coordinate with the other vendors to ensure we are all on the same page – catering staff, photographers, videographers, coordinator, and others. Music Selections are always well known, popular picks from all eras, genres and styles – customized to your liking. Inappropriate music is never played and your “Do not play list” is a top priority. Assist with planning and recommendations on Lighting and other enhancements to assure your wedding stand’s above the rest. Have a Wedding planner? Great! We are always glad to work with your planer, coordinator or designated person to ensure the perfect Wedding day. Is your Wedding ceremony outdoors? Or in a different location of the same venue. We can assist you with your wedding ceremony by providing the necessary equipment, music and services to ensure an enjoyable and smooth flowing ceremony for you and your guests. 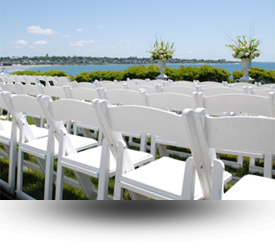 We can provide the assistance needed with the planning of your ceremony activities, music and song selections. We offer professional audio equipment, wireless microphones, lighting, and music to create the perfect ceremony. Our pricing is competitive and since not all Weddings are the same our prices vary depending on the type of Wedding, venue location, time of event, date and services chosen. Wedding packages start at $1500 and range up to $1800 for up to 5 hours of coverage. Extra fees apply for overtime, if a second sound system is needed for ceremony or cocktail hour and if you require lighting. Each entertainment package is customized to suit your needs and budget, so contact us today for a price quote that's tailored to your Wedding.